All little bit of mint and a little bit of chocolate! Recipe courtesy of Signe Langford. 1. 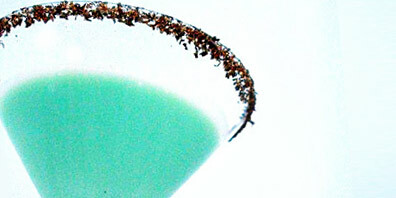 Fill a cocktail shaker with ice then add the whiskey, crème de menthe and cream. Shake well and pour into a chilled martini glass. Easy garnish: shave some dark chocolate over the surface of the drink. For something a little bit snazzier, shave chocolate onto a plate, dampen the glass under cold water, then dip the rim of the glass into the chocolate. You can do this ahead and keep a supply of glasses in the fridge or freezer. 2. Tip: a vegetable peeler or micro planer does a good job shaving dark chocolate.